At Rowan ECE, we provide cutting edge facilities and equipment to our students. And students do not wait until senior year or until they become graduate students to use top-of-the-line and modern equipment and instrumentation. How quickly do you get to learn and use them? How about day 1? You will take at least two classes, Introduction to Digital Systems and Freshman Engineering Clinic I during your first Fall semester, both of which will introduce you to some very cool equipment. Of course, one of the perks of being an ECE is that you get to play with really cool "toys". Furthermore, we believe that reliability in measurements is of paramount importance in ECE, and therefore - unlike most EE and CE programs - Rowan ECE program calibrates all of its instrumentation and measurement equipment every year. A unique facility for ECE Department is our Rapid Prototyping and Fabrication Center. 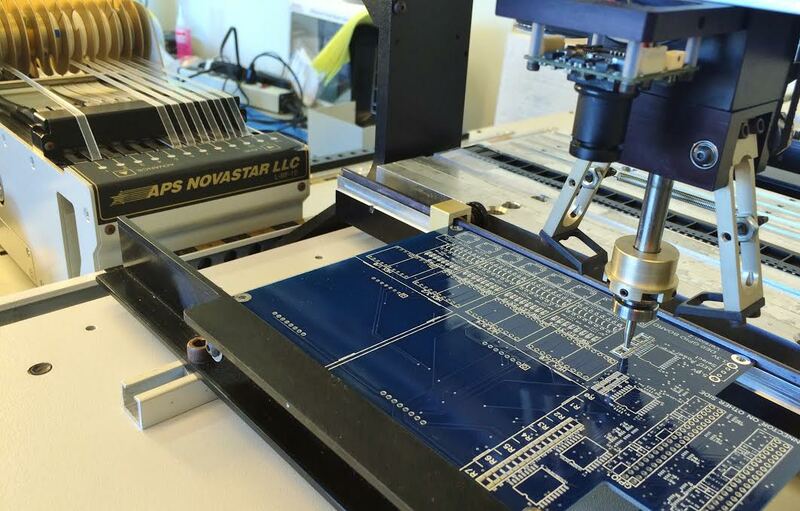 It is equipped with everything you need, including manual, semi-automatic and fully automatic pick & place machines, stenciling, reflow oven, milling machine for printed circuit board layout and design. A variety test and measurement equipment are also available to test, verify and evaluate your design. And, of course, no such facility would be complete without 3-D printers. For detailed information about research labs, please visit Research. Used primarily for the computer engineering part of our curriculum, Computer Architecture and Embedded Systems Lab feature 12 identically equipped workstations featuring brand new high bandwidth 1GHz scopes that include all the digital communication protocols, logic analyzers, as well as function generators. The lab also features digital multimeters, power supplies, FPGA design, development and simulation kits. 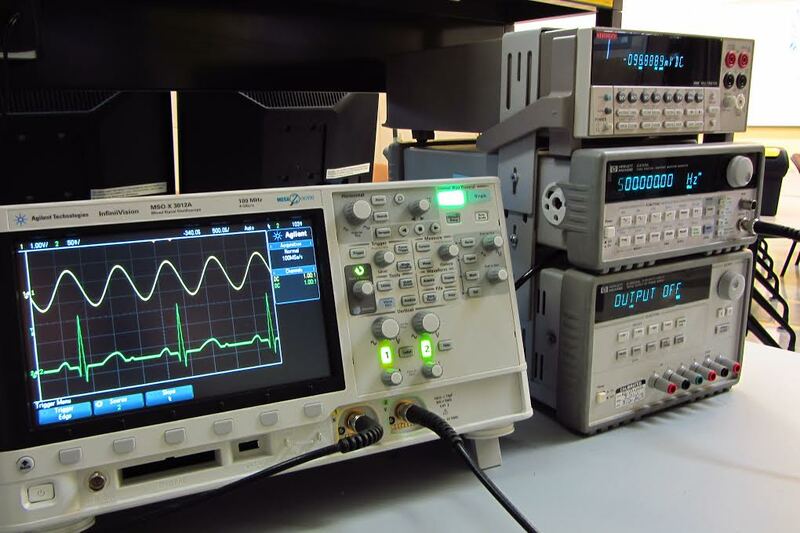 This lab provides 12 identically configured lab stations (one station for every two students), featuring new 100MHz scopes, signal and arbitrary function generators, digital multimeters, and power supplies. Also included are LCR meters, soldering stations, and other useful equipment, such as curve tracers. The lab serves the basic circuits and electronics classes. A unique feature or ECE labs is that they provide a combined lab/lecture environment, allowing a seamless integration of lecture, experimentation, and collaboration. All shared resources, parts, supplies, cables, everything you can possibly think of for building your ideas are available at the ECE Resource center. Stocking over a million different parts, chances are you will find what you need here. ECE Resource Center is staffed with our technologist as well as student workers who are here to find you the part you need and answer any question you may have. To make it even easier to find what you need, visit the ECE Resource Center page, where you can see our inventory, as well as information on how to order parts and components. The lab also features 12 identical lab stations that include 100 MHz scopes with function generators, digital multimeters, power supplies and computers. This lab also allows students to understand fundamentals of signal processing through an application with which we are all intimately familiar: audio. The Department also provides synthesizers, audio mixing and analysis devices and software for any student interested in audio applications. As in other labs, soldering stations and other relevant equipment are also available. In addition, high-end network analyzers as well as a spectrum analyzer for electromagnetics, communications, and RF electronics courses. Our newest lab consists of high-frequency, high-bandwidth and high-end devices, and serves our telecommunications, electromagnetics, RF electronics, optical communication classes. 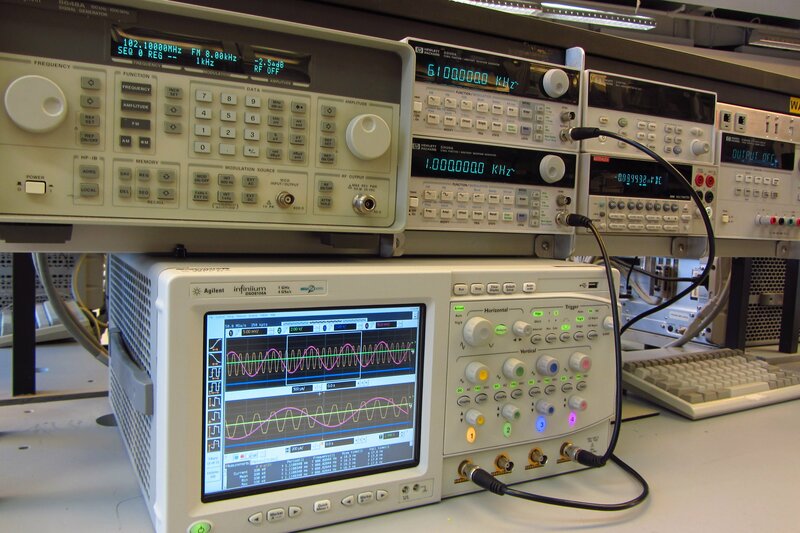 The lab features 6.5 GHz full-function desktop network analyzers, 3GHz spectrum analyzers, hand-held network analyzers, 6GHz scopes with full protocol analysis functionality, 3GHz RF signal generators, as well as digital multimeters, power supplies, and other cool toys. Rowan University has recently partnered with Cadence Design Systems, all information about this program can be found at our Cadence University Program website. Rowan now offers the student downloadable full MATLAB suite (including Simulink) to all students on campus — you always get the latest release. Also available are several additional software suites, including SolidWorks, CreativeCloud, etc.